The significance of the cross cannot be overstated for a person who believes the collective sin of the world was nailed to a single cross in Jerusalem during the first century AD. The Son of God, Jesus, experienced execution by crucifixion. An artifact discovered in 1968 brought the first century form of crucifixion to our present-day lives. Construction workers were working on a project in a suburb north of Jerusalem. To their surprise they accidentally uncovered a Jewish tomb dating to the first century. Inside the tomb was a stone ossuary (bone box) bearing the Hebrew name John. Inside the ossuary were found the skeletal remains of a man in his twenties who had been crucified. How did they know the young man had been crucified? The man, stunningly, still had a nail driven through his right heel. The iron nail measured 11.5 centimeters (4.53 inches) in length. Why was the nail still in his heel? The end of the nail was bent. It looks like what happened is while the nail was being driven into the cross the nail hit a knot in the wood and bent. The people burying the man left the nail in place. Remains of olive wood, additionally, were found between the head of the nail and the heel bone. These bones found outside Jerusalem, amazingly, can be dated to a time very close to the time of Jesus. This young man was crucified in a way slightly different from Jesus. His feet were nailed individually to the outside of the cross. His arms appear to have been tied by ropes. His arms wouldn’t have experienced the same pain Jesus experienced, yet it probably took him much longer to die. 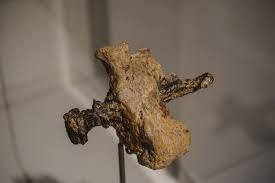 This artifact proves that death by crucifixion was happening in the exact city and at the exact time mentioned in the New Testament. As we look at the nail driven into this foot we can only imagine if the same man swung the hammer placing nails in the arms and feet of Jesus. Were the nails forged by the same blacksmith? We will never know. This artifact gives us more confidence toward the historical reliability of Jesus’ death on the cross which has bought us life. Dear Lord, we thank You that artifacts are found they keep showing the truth of the Bible. Help us to share the confidence that we have what You did for us to those around us. In the Name of Jesus, Amen.